AAI Notification is out. AAI is recruiting for 264 Apprentice Govt Job Posts. 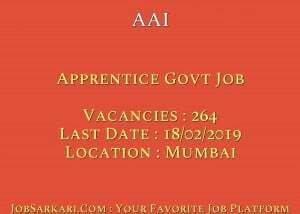 You can check AAI - Airports Authority of India last date, download AAI notification, visit AAI official website and check other AAI Vacancy details.Complete Vacancy and recruitment Details about 264 Apprentice Govt Job vacancies in AAI are provided below by JobSarkari.Com only for you. Last Date of Receipt For Application Form 18/02/2019. Graduate Apprentice (Mechanical Engineering Auto). Candidate Must Have Passed Degree in Engineering or Technology (Mechanical/ Automobile). 06. Graduate Apprentice (Public Relations). Candidate Must Have Passed Graduation With Degree/ PG Diploma in PR/ Journalism. 02. Graduate Apprentice (Airport Terminal Mgt.). Candidate Must Have Passed Class 10th/ 12th With 3 Years Diploma in Hotel Management or Graduation With Diploma in Sanitation or Public Hygiene/ House Keeping. 03. Graduate Apprentice (Finance). Candidate Must Have Passed Graduation And Having B.Com With Computer Training Course of 3 to 6 Months. 25. Graduate Apprentice Law. Candidate Must Have Passed Graduation in LLB. 01. Graduate Apprentice (Communication Navigational Serveillance). Candidate Must Have Passed Bachelor Degree in Engineering/ Technology in Electronics/Tele Communication /Electrical with specialization in Electronics. 03. (lnformation Technology). Candidate Must Have Passed Bachelor Degree in Engineering/ Technical in Computer Science/ Computer Engineering/ IT/ Electronics or MCA. 04. Graduate Apprentice (Engineering Civil). Candidate Must have Passed Bachelors Degree in Engineering/ Technology in Civil. 35. Graduate Apprentice (Engineering Electrical). Candidate Must have Passed Bachelors Degree in Engineering/ Technology in Electrical. 14. Diploma Apprentice (Mechanical Engineering Auto). Candidate Must Have passed Diploma in Engineering or Technology (Mechanical/ Automobile) As Mentioned in Notification. 16. Diploma Apprentice (Communication Navigational Serveillance). Candidate Must Have Passed Diploma in Electronics/ Telecommunication/ Radio Engineering. 16. (Computer Science). Candidate Must Have Passed Diploma in Engg./ Technical in Computer Science/ Computer Engineering/ lT /Electronics. 01. (Engineering Civil). Candidate Must Have passed Diploma in Civil. 27. (Engineering Electrical). Candidate Must Have passed Diploma in Electrical Engineering. 31.
lTl Trade Apprentice (Motor Vehicle Mechanic). Candidate Must Have Passed Certificate in Vocational Course ( in Mechanic-Motor Vehicle) Involving 2 years of Study After the Completion of Secondary stage of school Education/ Class 10th. 21. (Diesel Mechanic). Candidate Must Have Passed Certificate in Vocational Course ( in Mechanic-Diesel) Involving 1 years of Study After the Completion of Secondary stage of school Education/ Class 10th. 02. (Auto Electrician). Candidate Must Have Passed Certificate in Vocational Course ( in Motor Vehicle Mechanic. or Electrician or Electronics Mechanic) Involving 1 years of Study After the Completion of Secondary stage of school Education/ Class 10th. 01.
lTl Trade Apprentice (Tractor Mechanic). Candidate Must Have Passed Certificate in Vocational Course ( in Mechanic-Tractor or Farm Machinery) Involving 1 years of Study After the Completion of Secondary stage of school Education/ Class 10th. 01.
lTl Trade Apprentice (Communication Navigational Serveillance). Candidate Must Have Passed Certificate in Vocational Course ( in Electronics/ Telecommunication/ Radio Engineering) Involving 1 years of Study After the Completion of Secondary stage of school Education/ Class 10th. 18.
lTl Trade Apprentice (Engineering Electrical). Candidate Must Have Passed Certificate in Vocational Course ( in Engineering) Involving 1 years of Study After the Completion of Secondary stage of school Education/ Class 10th. 37. Age Relaxation. 3 Years For OBC, 5 Years For SC/ ST.
2. Candidate Can Download Application Form As Given On our Website in Important Link Section. 4. Candidate Need to Send the Application Form on Given Address on or Before 18th February 2019. Airport in Western Region to Airports Authority of lndia, Regional Headquarters, Western Region, lntegrated Operational Offices, Recruitment Cell,4th floor, New Airport Colony, Hanuman Road,Vile parle (East), Mumbai-400099. Q. What is the Last Date For AAI Apprentice Govt Job Vacancy ? A. 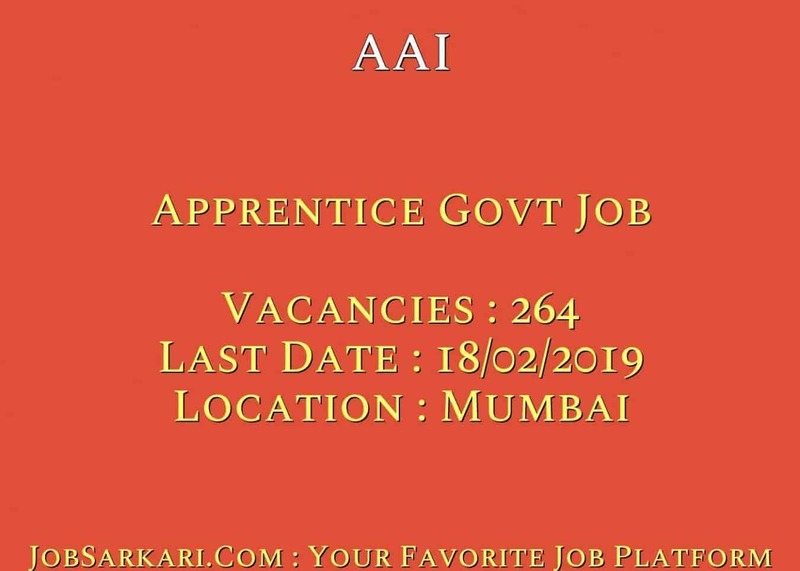 Last Date for AAI Apprentice Govt Job Posts is 18/02/2019. Q. What is the Form Type of AAI Apprentice Govt Job Recruitment ? A. The Form Type for AAI Apprentice Govt Job Posts is Offline. Q. How many vacancies are available in Airports Authority of India Apprentice Govt Job Posts ? A. There are about 264 Vacancies in Airports Authority of India Apprentice Govt Job Posts. Q. What is the Full Form of AAI ? A. Full Form of AAI is Airports Authority of India .